This "Intrepid Spirit" Limited Edition Sea Turtle Sculpture is created by award-winning artist Kitty Cantrell. 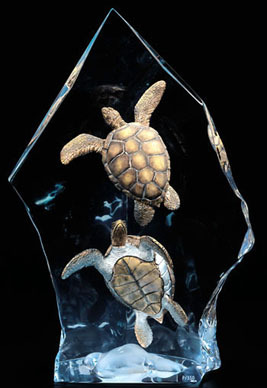 These two turtles swim gracefully through the sea, encased by the Lucite® which surrounds their metal bodies. Cantrell has masterfully captured these sea turtles in a magical bond. This art piece is made of Mixed Media Bronze Sea Turtles that are suspended in Lucite. Lucite® is an optically clear, hand-crafted material that has the ability to be reformed into any desired shape. Several magnificent finishes-from crystal clear when polished, to a milky-white opaque when frosted can be achieved. It has the desirable characteristics of transparency and crystal clarity. Lucite® is also UV resistant. Limited Editions Limited to 350.